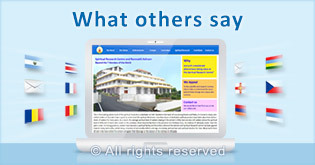 This is the building where most of the spiritual research has been undertaken. Nestled in the heart of Goa among forests and fields, it is home to many committed seekers of God who have a quest to understand the spiritual dimension. Countless hours of dedicated spiritual practice have taken place here by hundreds of seekers for many years. As a result, the average spiritual level of seekers staying in the ashram is 50%; there are also 100 seekers above the spiritual level of 60% and 10 Saints who reside on the premises. 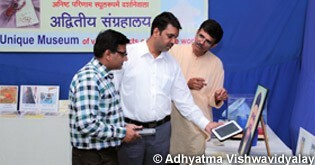 Most importantly there is the presence of a Parātpar Guru, His Holiness Dr Athavale onsite. 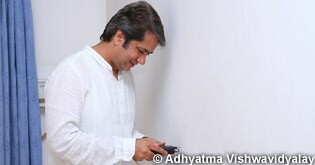 Over the years under His loving guidance, seekers have become a spiritual family and the entire culture at the Ashram and Spiritual Research Centre has been geared towards living Spirituality, sāttvik living, reduction of personality defects and ego, increasing spiritual love and spiritual emotion (bhāv) for God. Many Saints from all over India have visited the ashram and given their blessings to the mission of His Holiness Dr Athavale. Due to the intense Service unto the Absolute Truth (satsevā) that takes place here for the spiritual betterment of humankind, powerful negative energies have also tried to obstruct seekers in their spiritual practice and tried to reduce the spiritual purity in the environment. However God’s energy on the premises has also increased in order to combat negative energy attacks and protect seekers. What has resulted is a smorgasbord of spiritual phenomena that has and continues to manifest on a daily basis. It includes spontaneous changes in both people and inanimate objects that may have taken place gradually or all of a sudden. 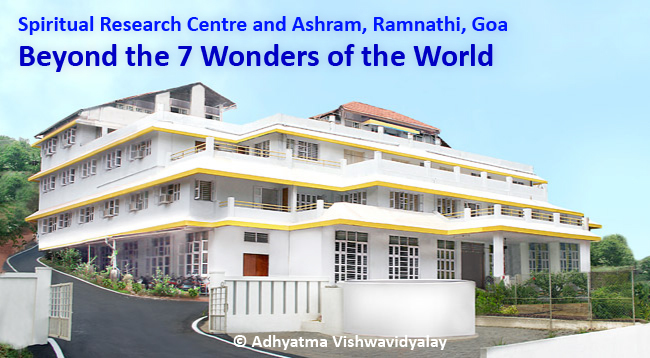 Scroll through the sections below as we display the various phenomena that have taken place and are continuing to do so in the Ashram and Spiritual Science Research Centre. Each picture represents a pathway to a larger picture or the concerned section if it is populated. Over the next few weeks, we will be populating each section. If you see a picture with a ‘Live’ sign on it, then it means that the section is populated and you can visit the corresponding section by clicking on the image. Black magic and voodoo seems to have been attempted on the Spiritual Research Centre. We have observed that there is a co-relation between such occurrences and seekers on the premises feeling weakness, tiredness, nausea, lethargy, depression etc. Blood stains are appearing spontaneously on clothes, walls and floors at the Research Centre in the absence of any wound. Forensic analysis shows that the stains are often blood however the blood group may differ from the blood group of the person it appears on. 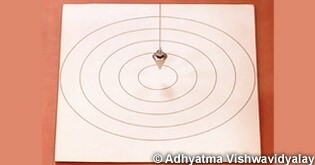 We conducted a study of the movement of a bottle in various rooms in the Spiritual Research Centre. Using exactly the same conditions to initiate the movement of a bottle, we saw that the very same bottle showed a wide range of oscillation timings. Beautiful butterflies that are attracted to spiritual purity come to the Spiritual Research Centre. Some of them sit peacefully for hours while some playfully interact with seekers. Their behaviour here differs from their usual behaviour elsewhere. Spectacular changes in the colour of some items used by Saints and seekers, as well as on their body. How does the colour of the objects they use change to a different colour? How do their nails, skin or hair obtain a tinge of yellow or blue colour? Even though the picture is laminated, bizarre coral stains seem to grow within the photograph. Even though the picture of His Holiness Dr Athavale is laminated bizarre coral stains is seen to grow under the lamination. According to spiritual research conducted we have perceived that the spiritual vibrations from the stains are negative. This is an example of a steel container that cracked with no known cause. Many items such as tea cups, vases, plates and steel containers developed cracks and fell apart spontaneously baffling their owners. Some of the items cracked in such a way that it seemed like they just fell apart. Unusual fading and disfiguration of printed photographs and pictures. How do such changes occur? 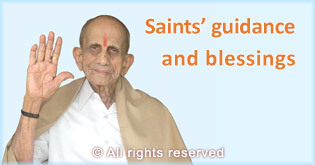 Why does this phenomenon happen most frequently on photographs of Saints? Other pictures in the same room did not show such changes. Frightening faces and other images that appear on walls, floors and in other places. Their expressions change from angry or scary to sad or desperate. Their eyes follow us when we move in front of them. Why do they appear? Some objects look like they have been gnawed by a rat, however this effect occurred spontaneously. Holes that suddenly appear on clothes, photographs or objects. Some of these holes later change shape or size over time. How do objects disintegrate to make way for such appearances? 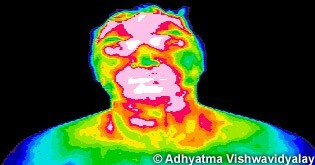 His Holiness Dr Athavale's body has displayed both colour changes and self illuminated areas. 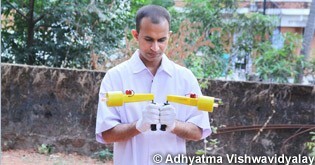 In this picture you can see the area of the chest and midriff of His Holiness Dr Athavale (left) is brighter. Shadows of stationary sticks, edges of walls, shadow of the building and the statue of Lord Ganesh are just some of the various objects that seem to move very gently in a to and fro motion. Can soil have spiritual properties? Spontaneously forming oily stains that spoil photographs of Saints and Deities, or clothes or glass. Oily stains may not look so horrifying, but are not to be underestimated as a phenomenon. How do they materialise and sometimes increase in size? A large collection of various types of orbs - why do they appear? And are they positive or negative? Various types of orbs have been captured in both photographs and videos at the Spiritual Research Centre. From orbs moving at high speed to some with the Om sign in them, the Spiritual Research Centre has an impressive collection of such orbs. Pests have been suddenly seen to appear in food. Pests have been suddenly seen to appear in food. In some cases the pests that appear are quite out of the ordinary as shown in this picture. Pictures of deities and Saints drawn by seekers have begun to look life like. Pictures of deities and Saints drawn by seekers have begun to look life like. 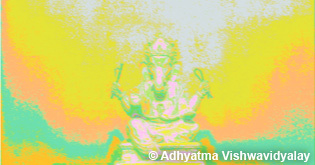 The eyes of the deity or person follow one around the room and sometimes their body turns in the viewers direction. Also their ornaments are seen to move. A ripple or studded kind of effect has begun to manifest on various ceramic tiles in the Centre. A ripple or studded kind of effect has begun to manifest on many ceramic tiles in the Spiritual Research Centre. They initially did not display such an effect. Scratches appear automatically on kitchen utensils, computer accessories, cupboards, walls & floors. Scratches that appear on kitchen utensils, computer accessories, cupboards, walls & floors. Some have appeared on photographs of Saints. Do these type of scratches differ from normal one in terms of the vibrations they emit? We have observed smoke coming out of various objects in the absence of any fire. Initially we were fascinated when we observed smoke coming out of an unlit incense stick. It looked like a light smokey trail. Then we saw the smokey effect coming out of various parts of the room in the absence of anything lit. The tiles in His Holiness Dr Athavale's room have developed an extraordinary level of smoothness. The tiles in His Holiness Dr Athavale's room have developed an extraordinary level of smoothness. Those who have slid their feet over the tiles have remarked that it almost feels like walking on silk cloth. Burning of items like photos of Saints or pictures of Deities, or seekers' belongings like bedding, clothes or other objects. How do signs of combustion occur and how does one explain soot residue in spaces that have not witnessed an actual fire? Surprising tears and cuts which appear on clothes, newspapers and photographs. Some of these items are new or hardly used, and it is difficult to explain the changes. What is the reason for spontaneous appearance of such tears and cuts? Objects have been getting displaced from their original position on their own. His Holiness Dr Athavale was by profession a clinical hypnotherapist, basically a man of science, and was also an atheist. As a doctor, He spent many hours painstakingly recording, analysing and publishing research He had conducted in the field of clinical hypnotherapy. He had undertaken extensive research on clinical hypnosis both in India and overseas when He was in Britain for seven years from 1971 to 1978. Eventually he became known as an authority on the subject and was invited to other countries to speak on the subject. Overtime however, he realised that 30% of His patients He could not cure, however when the same patients would visit some Saints they would be benefitted. This aroused His curiosity and He made efforts to learn from Saints about what was missing from his own field. They opened His mind to an entirely new dimension that is the spiritual dimension and how it exerts its influence in a variety of ways in people’s lives. As a researcher, a doctor and a man of science, He showed courage in not brushing aside this possibility, as an average scientist may have been tempted to do. Instead He embraced this new knowledge and quickly realised that it had sweeping ramifications for humanity. For the next 30 years, His Holiness Dr Athavale joined by other seekers continued to study the impacts of the unknown spiritual dimension on the known physical realm. Due to this study the Spiritual Research Centre founded under his guidance arguably has the largest museum of artefacts and case studies that have shown spontaneous changes with no known cause. The question is, are such artefacts a physical hint of the existence of the supernatural? Today we open the doors of the Spiritual Research Centre and invite scientists, professionals and researchers in related fields to join us in our quest for the Absolute Truth. Can the unexplained phenomena occurring in the Centre such as spontaneously appearing blood stains or Divine particles be the proof of the spiritual dimension that mankind has been searching for? It is a win-win situation all the way. 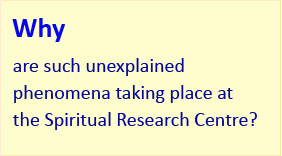 The Spiritual Research Centre is a hallowed ground and a veritable laboratory of spiritual phenomena. 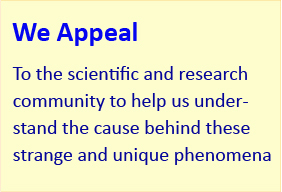 Scientists and researchers in their respective fields have the latest equipment to measure such kind of phenomena. Both sides have a vested interest in increasing the frontiers of their understanding about the world around us. This partnership presents potentially a unique opportunity for a meeting point between modern science and Spirituality. This partnership may indeed have the potential to change the way we look at the world and re-establish some fundamental known laws of nature. 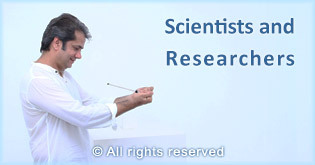 If you are a researcher and you would like more information about the research we have conducted using any of the above instruments, you can contact us by using our login facility.